With the same time zone and latitude (south, rather than north) as Hawaii, the islands are sometimes thought of as "Hawaii down under". Though smaller, it reminds some elderly visitors of Hawaii before statehood without all the large tourist hotels and other development. Named after Captain Cook, who sighted them in 1770, the islands became a British protectorate in 1888. By 1900, administrative control was transferred to New Zealand; in 1965 residents chose self-government in free association with New Zealand. New Zealand handles defence, foreign affairs (including issuing passports) and currency; otherwise the islands are self-governing. This includes immigration, which is strictly controlled -- even for non Cook Island New Zealanders. Tropical, moderated by trade winds. 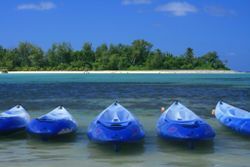 Rarotonga has average maximum temperatures of around 25°C (77°F) in winter (May-October) and 29°C (82°F) in summer (November-April), temperatures in the northern islands are several degrees higher. Rainfall mostly occurs in summer, usually in the form of afternoon storms. Cyclone season is November to March, although the islands are hit by a big one only once every five years or so. Tourism facilities are well developed on Rarotonga and Aitutaki, and information is available. However you won't see a single tout, and tourist scams are unheard of. If you want to organize something, it usually isn't hard to do, but you will need to make the first move. Low coral atolls close to the equator. The islands are hotter, sparsely inhabited and difficult to travel to. Mostly volcanic and hilly islands, with a few atolls. These islands host most of the population and includes the two main destination islands of Rarotonga and Aitutaki. All visitors to the Cook Islands, irrespective of nationality, are visa exempt for a maximum stay of 31 days. Visitors travelling for touristic purposes may extend their stay, for periods of 31 days, up to a maximum of 6 months. There is a departure tax of $55 per person adult and $15 per child between 2 and 12 but this is now included in your ticket price. You must have a reservation for accommodation pre-arranged or you may be sent back (or onward) on the next flight out. Camping on the beach is not allowed. Rarotonga International Airport (IATA: RAR) is the main gateway to the Cook Islands. There are daily services to Auckland (3.5h) and weekly services to Sydney, Fiji and to Los Angeles. The only international airlines at present are Air New Zealand, once-weekly Air Tahiti, and twice-weekly Virgin Australia (ex. Pacific Blue). Air New Zealand has code share arrangements with other Star Alliance members including United Airlines, and Rarotonga is a popular stopover on Round the world flights. Domestic inter-island service is provided by Air Rarotonga. Although you can book flights through Air New Zealand, it is usually cheaper to do so directly with Air Rarotonga. This has become much easier in the past few years, now that they offer on-line booking. Unless you're a member of Air New Zealand's "Airpoints Dollars" program, you won't receive any airline miles for Air Rarotonga -- and then only if you book through Air New Zealand, often at a higher price. Star Alliance mileage for Air Rarotonga is not available. The intrepid traveller can visit all inhabited islands by inter island freighters, but these can be weeks apart or worse if you want to get the really remote islands. Details of services are published in local island newspapers. There is a bus line that circles around the island, in both directions. Although there are official bus stops, the driver has no problem stopping where ever you want him to. As for the drivers: Often they like to chat a bit, and make some jokes, so if you for any reason should need some cheer-up, just take the bus! It is very common for tourists to rent a scooter, but you need to make a Cook Island driving license. If you have a valid driving license, it is just a formality, but bring some time, since there is usually rush hour the day after the plane from New Zealand arrived. There are five living languages in the Cook Islands with English and Cook Islands Maori the official languages. Cook Islands Maori is called Rarotongan after the capital island and is the most widely spoken version of Maori in the Islands. 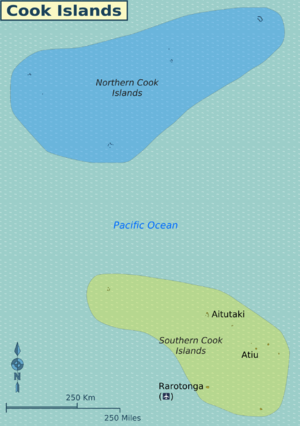 Others are Penrhynese, unique to the Northern group island of Penrhyn and rapidly disappearing, and Rakahanga-Manihiki, spoken by about 2,500 Cook Islanders, only half of whom on the two islands from which it takes its name. You can do some really nice snorkeling in the lagoon that surrounds Rarotonga. Or go scuba diving outside the lagoon (there is at least one dive shop). Among the usual reef inhabitants you can see turtles, rays, and when the season is right, you might even see whales. Visit the market on Rarotonga. A good chance to enjoy fresh ika mata, to watch some traditional dancing and to buy some craftwork. Find a guide and take a hike into the mountains. If you are interested in Polynesian culture, it is worth visiting one of the other islands, for example Atiu. If you talk to the people (there are not many), you might find someone like Papa Paiere, who might take you on tour around Atiu, and show you the places, where history happened, both Polynesian and European. Also on Atiu Marshall Humphreys offers a tour to the caves, which includes a short hike through the jungle. In the caves you can take a swim, you will hear stories about the islands and the caves, and get a digestible amount of Polynesian culture. You will see some endemic birds that live in these caves, and which manage to fly in total darkness, just like bats. And, of course, enjoy the beauty of the caves! The Cook Islands use the New Zealand Dollar, but also issue their own banknotes and coinage, including two varieties of highly unusual $3 banknotes and the triangular $2 coins. Cook Islands money can only be used within the Cook Islands. Overall, much cheaper than nearby Tahiti, though anything imported will be expensive. This especially applies to fuel and milk. There is no fresh milk made on the islands, and the only fresh milk available is air-freighted from New Zealand daily, and costs around $7.00. Locals generally get by with powdered or UHT milk. Meat in turn is expensive, because usually imported. There are chickens and pigs on the islands, but not enough to feed a crowd of every-day-meat-eaters. Fish you get at the harbor, but you have to go there early in the morning. There are 2 Microbreweries ( Matutu and Cook Islands Brewery ) which both produce a range of delicious beers. Matutu brewery (just few km south of Muri Beach) can be visited for a tour. Try not to eat snapper fish, they may give you ciguatera. Mosquitoes are mostly a nuisance, though every few years there is a dengue fever outbreak in the wet season. No malaria, or other serious tropical diseases to worry about, (but do take dengue fever seriously during outbreaks).